Providing your dog with a balanced and nutritious diet is the perfect way to ensure they stay healthier and happier for longer. However, when it comes to feeding dogs, people are often confused about what is the correct amount. By reading our guide you should come away with a clearer idea on how much you should feed your pet. This article will guide you through how to interpret these feeding guides. First things first, are you feeding the correct product? 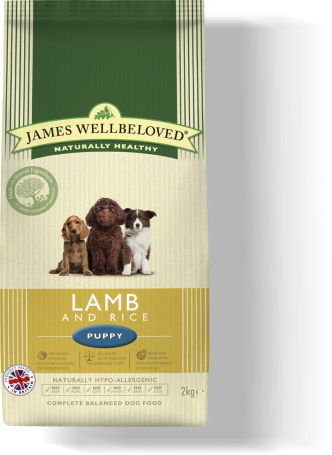 Our product range is split into two core ranges: our traditional with rice and our grain free range. Both ranges then offer life stage specific diets (puppy, junior, adult and senior) aswell as size specific diets (small breed up to 10kg, medium from 10 to 25kg and large breed 25kg plus). In the majority of diets we offer a choice of four different tempting meat proteins: turkey, duck, lamb and fish. Try our product finder to discover the right diet for your dog! Growing puppies have additional nutritional needs compared to adult or senior dogs that are looking to maintain their weight and, because of this, their diets are formulated with higher protein and fat levels. With growing dogs, our feeding guidelines are based upon their expected adult body weight to take into account their growth requirements. To calculate the correct amount, select the appropriate expected adult body weight from the column and then choose your puppies age. Follow both the row and column to reach the correct amount. As your puppy grows the amount of food it requires will change so regularly refer to the feeding guideline to ensure you are feeding the correct amount. Based on your dog’s expected adult weight, the feeding guideline will advise you which product to move onto next. Larger breeds have longer development phases and they require specific junior or large breed junior foods depending upon their expected adult bodyweight. Our adult and senior feeding guidelines are based upon your dog’s current weight. A choice of activity level is also offered so that you can tailor your dog’s allowance. As with people, a more active dog will require more food to maintain muscle mass and good health. To help you feed your dog the correct amount for their activity level, James Wellbeloved provides feeding guidelines for three activity levels: high, normal and low. ‘Normal activity’ for the dog involves walking on the lead for two to three hours a day or around an hour a day running off the lead or playing hard with its owner or with other dogs. Of course, a toy dog walking on the lead at 4mph for half an hour will burn a lot more calories than a Labrador doing the same thing. To calculate the feeding quantity for your dog, choose your dog’s current bodyweight and then select the correct activity level for your dog. Our light dog food is designed to meet the needs of dogs with a tendency to gain weight and as such, there is two feeding options – recommended allowance to maintain existing weight and recommended allowance to promote weight loss. If your dog is currently at the correct weight but is greedy and gains weight easily, feed according to the “maintain existing weight” guide. If your dog is overweight then feed according to the “promote sensible weight loss” guide. If your dog is seriously overweight or obese, then consult your vet for advice on a suitable weight loss plan. Both sets of feeding guidelines are based upon your dog’s current weight. Therefore if you are following the weight loss guideline, as your dog loses weight the amount you feed will reduce. Therefore check back routinely during your dog’s weight loss regime to ensure you are feeding the correct amount. The guides offer both inactive and active feeding guidelines so you can tailor your dog’s allowance. You should feed your dog for their ideal weight, which isn’t necessarily their current one. The body condition scoring system is used by vets to determine whether your dog is underweight, ideal or overweight. 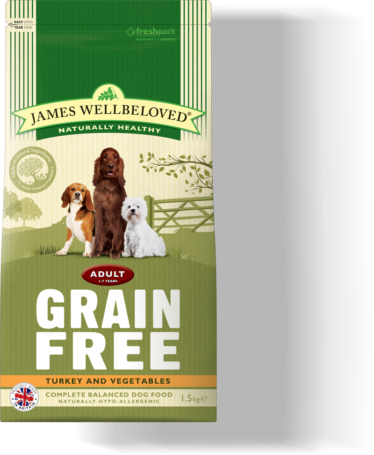 If your dog is anything but ideal then we recommend you make changes to your dog’s diet. If you have been feeding your dog in excess of their daily needs and they are overweight, we would recommend feeding a light diet. If your dog is under weight, then you need to sensibly increase their feed allowance, speak to your vet to ensure this is done in the correct manner. Refer to the feeding guidelines themselves for additional detail about when to move onto the next life stage, the recommended number of meals to feed and ideal storage conditions. Remember the feeding guide is only a guide and a starting point with which to calculate the pet’s food intake. Every pet is different, and you’ll only know that you’re giving the right amount of food if the dog or cat is at its ideal weight and stays at that weight.